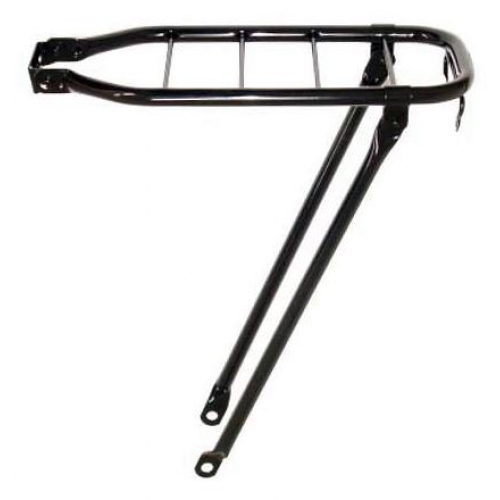 Sturdy steel Dutch luggage rack for 28" wheel bikes. Optionally includes a kickstand which flips down past the rear wheel. The overall length of the rack is 44 cm (17"). The flat part is 32 cm long and 16 cm wide (12.6" x 6.3"). The Basil Basonyl pannier bags are a perfect fit on this rack. Note that for safe installation you need to have wheels with wheel nuts. 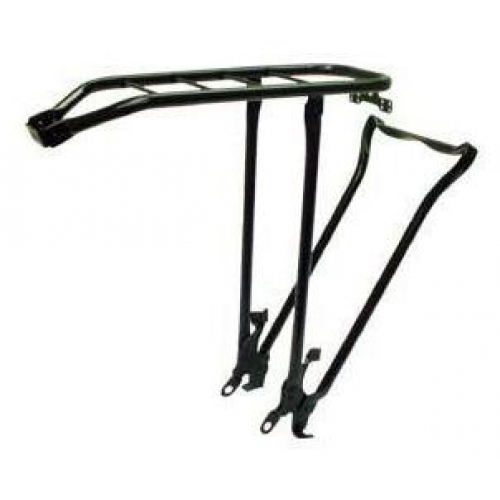 This rack is not designed to be used with quick release wheels. If yoiur bicycle does not have a plate on the seat stays for attachment of the rack you will also need a set of mounting parts. Steco has made racks in these and other designs for over 86 years. The company makes no statement about a weight limit for this type of luggage rack and therefore we also can offer no guarantee about their capacity. However you can expect these racks to cope with any reasonable load on a bicycle. These are extremely sturdy racks made of relatively large gauge steel tubing and they are precisely the type of rack which generations of Dutch people have spent decades using not only for cargo but also to transport both child and adult passengers on the back of their bikes. Note: It's not possible to buy just the stand to fit a rack which you already own. The racks with stand are necessarily made differently to those without and there is no part that you can optain which will convert one type of rack into the other. If you already have a rack and need a stand please see our range of stands.